The alumni association of any institution is a dynamic link between its past and present. 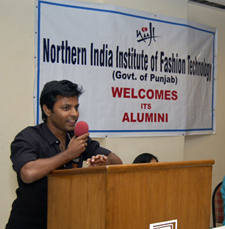 In an endeavor to provide a platform for the alumni to share their expertise and knowledge, and forge an enduring relationship with their alma mater, the NIIFT Alumni Association was set up in April 2005. To promote and foster mutually beneficial interaction between the alumni and present students of NIIFT, and within the alumni network itself. To encourage the alumni to take an active interest in the work and progress of NIIFT so as to contribute towards enhancement of their alma mater. To interact closely with the industry and the Institute in order to make NIIFT education responsive towards industry needs and technological advances. To institute prizes and awards for outstanding project work, research paper or other professional activity by NIIFT students, and also suitably recognise outstanding social and community service by the alumni and students.